Growing: Â Easy This is a marijuana strain hybrid between two of the most famous marijuana strain. It is the combination of the most potent marijuana heavyweights Jack Herer X NYC Diesel. 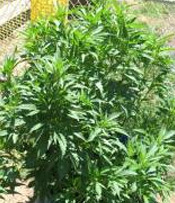 Know that due to the presence of the sativa genes in this marijuana strain, the flowering period of Jack Diesel was extended to 10 to 12 weeks. However, even though the flowering time of this strain is very long, the yields that it is able to deliver are monstrous. Â Jack Diesel has a very pungent yet distinct aroma that is present when the plant reaches its flowering period. Know that the smell intensifies as Jack Diesel matures. In addition to that, know that Jack Dieselâ€™s calyxes swell up as the plant grows.The growth potential of Jack Diesel is very high that is why there is no need for the growers to do a long vegetative period. The effect of this marijuana strain is said to be a typical haze high â€” powerful and uplifting.